The table below contains our weekly swing signals. The report is updated each Monday within 2 hours of the open with new signals for the week ahead. 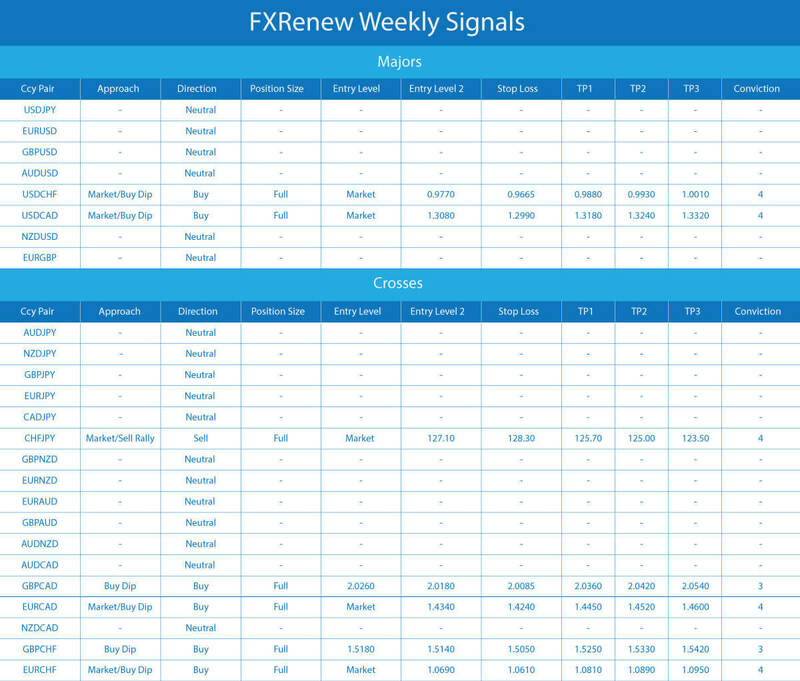 Throughout the week we will update the signals as appropriate here. How the signals are put together. First we assess the market type for the currency pair. We then review the fundamentals and make a call on direction and strategy as a team. After that Fxrenew888 constructs the trade based on key levels. The goal of the program is consistency and safety. Using the signals. A trader should not take all the signals, just the ones that they agree with. You may also choose to use only the limit orders or only some of the profit levels. Trading with signals is most effective when you make it your own and fit it to your trading style and objectives. How much to risk per trade. You want to keep your risk limited to the same amount each week, even if you are trading a different number of signals. You can input your account data and trades into this position sizing algorithm spreadsheet. A training video will follow soon. Conviction levels. We mark each position with a conviction level from 1-5, with 5 being the highest. You can use this to help you decide which trades to take for the week. Conviction is based on a number of factors including the fundamental and technical picture and the other positions in the report.